Modern western Christianity seems to be moving toward, at least in part, an attempted synergistic mixing of Christian principles and secular humanism. We follow those teachings that bring us the greatest fulfillment or that broker acceptance from those we value, avoid most things that require deep faith or great sacrifice, thus elevating ourselves or the group to the position of god. This is a very complex and serious thing to me. We have found a way to secularly humanize Christianity with the pursuit of what feels right to us, often embracing logic, social justice, and self-fulfillment with no thought to God’s desire for us or faith while at the same time having the appearance of Christianity. Still having trouble wrapping your brain around what I’m saying? When people come together to study the Bible, they circle up, read a verse, and then ask, “What does this verse mean to you?” Fourteen answers and perspectives later, we’ve taken a text and filtered it through us to derive its meaning. And no one dare say, “This verse couldn’t mean that…” or you’re intolerant, dogmatic, and narrow minded. I agree that there is room for interpretation of the Bible, but not to the extent it’s normally taken. The flex should come in what that simple truth looks like as it’s put into practice in our lives. In my 20+ years of being a Youth Pastor, I saw it countless times. I would ask, “What does this verse say?” And 20 answers later there’s been an honest attempt at deeply spiritual things, philosophical things, application-type things, only to have to say, “Look at the verse. The answer is there.” Typically, we’ve run God’s Word through the filter of “me” in order to find its meaning. I started something this year with my kiddos. For each of their birthdays, I write them a letter telling them things I love about them. The number of things I list corresponds with their age, so today, I write 12 things about Jeremiah that I love. For those of you who know him, you’ll agree, or may even want to add your own here. Feel free to jump on! I wanted to start a tradition with you to share with you on your birthday things I love about you. I wanted to do this in writing so that you can keep them, if you’d like. 12. You have such a patient nature. I admire that. 11. You enjoy the outdoors, and are always up for an adventure! 10. You love your family in a way your age don’t. 9. I never could have imagined that, at 12 years old, we would be able to talk about the deep things we talk about. You’re a great thinker. 8. You have great focus. When you set your mind on something, you see it through. 7. You have a genuine, Christ-like care for people. 6. Your love for reading is something I really admire and love. 5. You have such an easy-going demeanor. You’re not easily rattled, and you take life in stride. 4. You care deeply for spiritual things, and are growing in Christ. 3. You often teach me important lessons in life, and are used often by God to help me develop my character. 2. You show a sensitivity to the needs of others, to peace, and to being a peace maker. That’s a rare quality in adults, let alone a teenager! 1. But most of all, I love that you remind me so much of Jesus. I am so proud of you, and if I’m this proud of you, I can’t imagine how proud Christ is of you. Happy Birthday, Jeremiah. I love you! This topic has been on my mind a lot lately. I think it’s because we, as Christians, are called to love above all else. Jesus reiterates the commandments when He says that the greatest commandments are: 1) to love God with all you, & 2) love your neighbor as yourself. Our cultures want us to believe that love looks like the movie “Friends With Benefits.” The trailer for that movie was a little much for me, but it might have been the German context. Some things here are more socially acceptable to throw out there. I’d be interested to see how different the US trailer spot is. Anyway, I digress. So, I just wanted to get the ball rolling on what could be a great conversation. I’ll just put it out there early, that I’d like to hear what you think love is. The rules: no cut-n-paste comments (only your original thoughts or thoughts on someone else’s thoughts), no attacks or actions that are unloving (I reserve the right to remove any post I feel leaves the heart of the topic), and be honest, not cavalier (by that I mean, don’t just throw out a general principle that someone else should aspire to. Talk from your heart). To get us rolling, I’ll start where my heart started with this topic. Love is more than just the fulfillment of an obligation out of a sense of duty. There are many who know this feeling of obligation or expectation that has not a shred of love intermingled. I admit that the expression of love is ripe with duty and obligation, but that’s not the motivation. Love is the motivation. DC Talk (showing my age) had a song called “Love is a Verb.” True, but I think love is the motivational foundation for whatever verb follows. For example, in the Garden of Gethsemane, Jesus prays that God would allow this cup (suffering and crucifixiton) to pass from Him. Does that mean He doesn’t love humanity? Does this mean that even Jesus had His limits of what He would do for love or that He now wanted out of an obligation He’d made because it was too hard? Hardly. Or, does it mean that Jesus only sacrificed because of His obligation? Does it mean that He had started a path he was required to see through? That’s not it either. Jesus’ love for His Father was the driving factor in all He did. If we take our eyes off of that, we miss the bulk of Jesus’ teachings! When Jesus says things like, “As you do to the least of these,” or “If you love Me you’ll obey My commands,” He is not saying, “Keep your commitments because you’re obligated.” Love moves us to action. Love moves us to sacrifice. Love keeps us obedient. But what about those days where you just don’t feel like you love the people like you need to? What about those days when it just doesn’t seem worth the sacrifice? Those are the days that we all have. But those are the days that we’ve taken our eyes off of Our Father and put them on something lesser. The question is not what am I obligated to do. Our focus is on Christ, the only one worthy of any and every sacrifice. If you’re sacrifice is solely for people, you’ll empty that tank pretty quickly. But when you keep your focus on Christ, your dead-end, “loveless” marriage can be a place of worship. Your over-demanding boss can be a source of blessing. This is what I take away from the Garden. When Jesus says, “Not My will but Yours,” He is showing us how to stay obedient and to live out love . It’s not about the worth or value of those you sacrifice for, or even feel obligated to serve. I think that will come, though. But at the heart of the matter is that your love for God drives you to live as He asks, love as He loved, and die as He died; and to do it all for Him. Well, I’ve run on enough. I’ll sum up by saying that love should be/is the motivator to obedient action for followers of Jesus. What do you think? What is love to you and why? I really look forward to Easter. Our Worship Leader asked us this morning during rehearsal WHY we look forward to Easter, especially in the area of leading worship. I thought for a long time about, and just now (4 hours later) came up with the answer. Because I know what happens! Let me give you a little glimpse into the inner workings of my psyche. Â Being the ever optimistic person that I am, I often times watch movies that I’ve seen before and actually find myself hoping that someone will make a different/better choice that changes the movie. Like in “Star Wars III,” I find myself almost willing Anakin Skywalker to choose the Light Side of the Force, even though I’ve seen the movie 100’s of times! Â I am usually, if not always, a “glass half full” kinda guy. I look forward to Easter, and specifically the celebration with the rest of the Body of Christ, because I know He came back from the dead, putting my optimistic slant to it. Now, I’m not saying He didn’t come back from the dead nor am I pleading a case for wishing He had done something different. But I realized this morning that The Disciples had a much different Easter, riddled with doubt, sorrow, pain, and mourning. For them it was different. Â Huddled together in a room one Saturday morning, they were plagued by trepidation and fear! I can imagine how they felt, almost trying to impose their will on the reality of their situation and force a different outcome. What I experience this Saturday morning is an eager anticipation of what tomorrow holds. What they experienced so long ago was just the opposite. Most of us can relate somewhat to the aftermath of losing a loved one. That “let down” when the funeral is over, the graveside done. But I sense it was more than that for them. I wonder what they anticipated the coming days held for them. I mean, Peter even denied Jesus in a feeble attempt to protect his own life. No, as they hid away from the authorities and the world around them, they were gripped with dread as well as sorrow. Which, to me, makes Easter even more meaningful for them! The “flavor” of their experience was turned from bitter to elation with the reappearance of Christ. Â I was once hopeless, though. I was once lost and fearful for my future. Having been a follower of Jesus these last 23 years, sometimes I forget exactly what Christ brought to me and brought me out of. I encourage you to spend some time in somber reflection today, trying to get into the heads of the Disciples as you remember what Christ brought you through when you realized He was alive for the first time. Reflect and remember today. Rejoice tomorrow! Wolfhart Pannenberg, D.D., asserts that the resurrection of Christ is the most pivotal event in human history. He correctly contends that every event up to AND since the resurrection is only properly interpreted when seen THROUGH the resurrection. 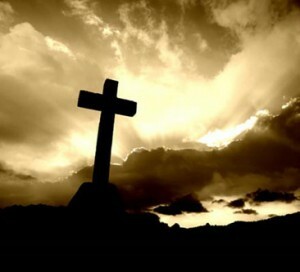 1) The Cross, as God’s ultimate and eternal plan, holds much more than egg hunts and candy for all humanity. Let’s face it, for most of the Western world, there is some sort of lip service paid to the meaning of Easter, and a greater expectation of a day off from work, candy, or Easter eggs. However, whatever the expectations, Easter is on the minds of most Western thinkers, even if it’s just in this superficial treatment of the holy day. As a follower of Christ, we have an opportunity to point people to something so much bigger than a day off. The Cross event is the single event upon which all of history hangs. The Cross event holds the key to correctly interpreting and extrapolating every event on the time line of humanity. We ought to be awakening people to the magnitude of this event, and inviting them to something so much deeper and greater than a chocolate bunny. 2) As “Jesus People,” we must be sure that we are Easter People all year long. We have an obligation to interpret the events of our every day lives in light of the resurrection of Christ. Since the Cross Event IS the most important event in history, and since we claim to have been eternally changed by the Cross Event, those who follow Jesus must model its importance in an ongoing fashion, and not just when it’s on the minds of our culture. How do you interpret the loss of a loved one? How do we interpret the great promotion at work? Unless every event of life is scrutinized in light of the Cross, we miss the point. I hope that this Easter Season, those who claim the name of Christ will also claim the impact of Christ. Our challenge should be to point others to The Cross, while we ourselves hold fast to The Cross.